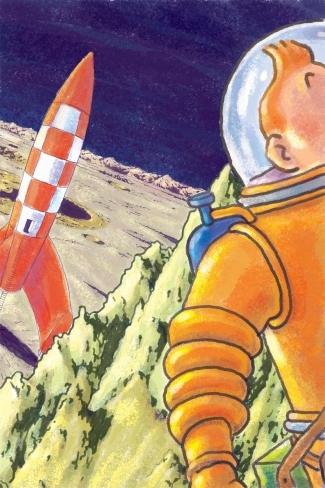 Tintin stars in timeless stories of wonder and adventure for all ages. A great film in every right way. Faithful, fun, frenetic, fulfilling. The movie suffers from not knowing whether to be animated or live action. A bold attempt to do something new. Herge's work was sophistication dressed in simplicity. His influence is directly echoed through Jacques Tardi's taciturn "Adele Blanc-Sec" (also made into a 2010 movie), Alex Toth's essence, Jaime Hernandez's punk, Daniel Torres' noir futurism, Vittorio Giardino's erotica, Geoff Darrow's hyperdensity, Chris Ware's minimalism, and the inversion of Tintin in Charles Burns' "X-ed Out" trilogy. Herge's smart characters, surprising stories, and richly-imagined locales are also a precursor for the Studio Ghibli and Pixar films. So how do you make a hyper-realistic CG film of a clean-line character without negating it? Steven Spielberg and Peter Jackson did it by finding the common denominator in Alfred Hitchcock. Both involve twisty plots, suspenseful intrigue, puckish humor, and elaborate action sequences. Crafting a film noir out of shadowless cartooning thus seems natural instead of contradictory. By creating the perfect Tintin film that Hitch should have made, they have given us a classic worthy of the books. The film is based on three volumes: The Crab With the Golden Claws (1941), The Secret of the Unicorn (1943), and Red Rackham's Treasure (1944). It captures Tintin's smarts, the Captain's irascibility, Snowy's pluck, and Herge's fun world. With luck we'll get the two more films they intend to make. © 2019 Four Color Films.